EATON — Since its inception two years ago, National Trail’s Buckeye Day has brought in close to $50,000 to be used toward community outreach. The money is split between National Trail School Districts’ two food banks, National Trail School District, Preble County Board of Developmental Disabilities, and the Driven Foundation. This past Buckeye Day was held on Friday, March 10, and brought 10 Ohio State alumni football players to the school to host a day of community outreach. They offered elementary school reading visits, middle and high school assemblies, a charity basketball game, and a barbecue dinner. Tickets were sold for the family barbecue dinner, which featured dinner, guest speakers, a silent auction, a live auction, entertainment, and free Buckeye autographs. Proceeds from the day went to the five groups and will go toward their programming. The groups came together on Tuesday, Sept. 26, and recognized the good the funds did for their organizations and discussed their plans for this year’s outreach day. 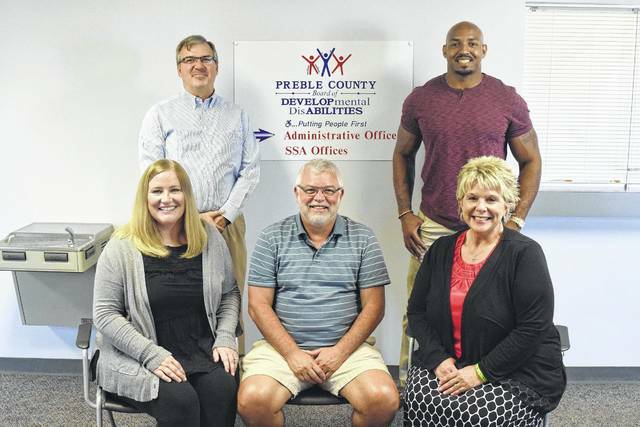 He added, the school district chose to use its portion of the money to help fund the Preble County Success School Liaison, which is a program that pairs the schools with a liaison who works with students to meet any needs they might have. “That’s great, but people are cheering because they’re winners and I think the one thing that is lacking is that in life there isn’t that consistency — we aren’t winning. We’re losing a battle, specifically against heroin addiction. That is across the board, Ohio is number one across the nation. What we’re trying to do, is not necessary just to fight that battle, but to get the Buckeyes in front of this fight to get people’s attention. “It is one thing to have a discussion with the principal and staff, but it is another to take these professional athletes and use their status to drive an intentional wedge and to bring attention to the cause at hand,” Hall continued. “We’re solving it through service and spending time in the schools. Obviously our community dinner helps, where we really get a chance to talk to the parents and staff members about why we’re there. For Preble County DD, they’ve been using the money from the outreach day to train and treat their individuals. “We’re using the money that was raised and that we were given for self advocacy. For our individuals to have the opportunity to attend trainings, both locally and regionally. They learn the skills to be able to speak up for themselves,” DD Superintendent Bethany Shultz said. DD Outreach Coordinator Amanda Kopf added, “The first event that we’re actually using this money for is our Regional Self Advocacy meeting. We have one big meeting a year. We are able to bring a group of folks that we are trying to mold into being confident speaking in the community to this meeting. According to Pastor Jeff Ginter, their portion of the funds help the food pantries purchase fresh produce and continue to provide programs like mental health counseling and connect people with employment services and healthcare. For him, what stands out about Buckeye Days is the model it provides to Preble County to emulate and copy in the future. “What I think is awesome about the event is that, like Roy [Hall] talks about, the platform that Ohio State Football has. What is does for Preble County and our area is it is a model,” Ginter said. “We can really take a hold of. They bring awareness and do all these different things addressing many different issues and they don’t just talk about it where they’re at in Franklin County, they talk about it here. While all four organizations appreciate the funds they received from Outreach Day, they all echoed — any amount of donation helps.